A ratio of demand to inventories is at its worst level in two years. A measure of demand for copper, the metal used in everything from power lines to electronics, is at the weakest in more than two years, signaling the meltdown that’s sweeping through commodity markets could get even worse. 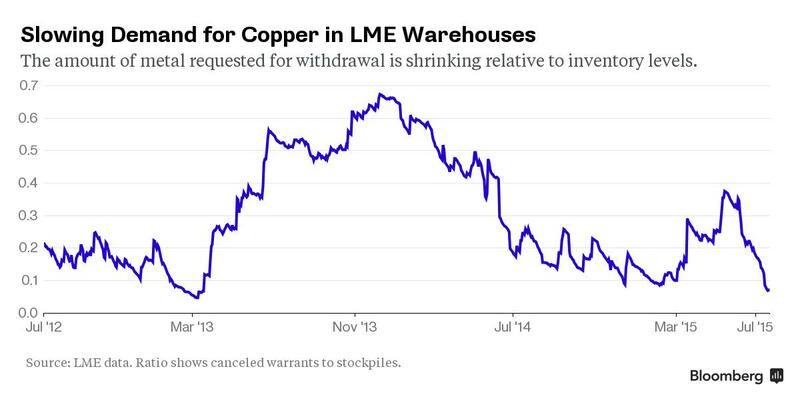 The number of requests to withdraw copper from London Metal Exchange warehouses relative to the level of global inventories tracked by the bourse dropped this week to the lowest since March 2013. That shows consumption has almost dried up for the stockpiles that have doubled over the past year. Slower economic growth in China, the world’s biggest metals user, helps to explain the drop in demand. For commodity investors, it’s a bad omen because copper has historically been used as an indicator for what’s to come in raw materials and as a gauge of global expansion. Copper futures for August delivery declined 1.7 percent to $2.433 a pound at 11 a.m. on the Comex in New York, heading for the biggest loss in two weeks. The Bloomberg Commodity Index of 23 components fell as much as 1.1 percent to 95.2578, the lowest since 2002. Prices have fallen as the U.S. moves closer to raising interest rates, which has driven gains for the dollar and cut the appeal of raw materials as alternatives.